In what has become a rare act of bipartisanship in government, President Donald Trump has signed an anti-opioid abuse legislative package aimed at reducing opioid-related addiction and deaths across America. Trump had declared the opioid epidemic a public health emergency in 2017, a proclamation which set the wheels in motion to empower the government to respond more quickly to the crisis. Since 1985 October has become known as National Breast Cancer Awareness Month around the United States. 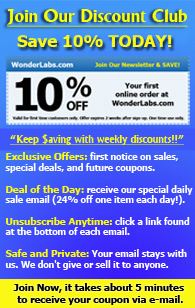 WonderLabs is happy to announce that a percentage of all sales for the month of October will be collected and distributed to three local organizations active in the fight against breast cancer. Our definition of splurge is turned upside down during the holidays. This is the time when we spend a little more on the ones we love, pay it forward in bigger ways to honor others, bend the rules to let the kids have one more cookie or stay up a little later, and indulge in all things delicious, from baked goods to chocolate and candies. While this time of year is the perfect reason to celebrate, we have a few tips to help you stay near the track instead of getting off of it completely!